Hyd. 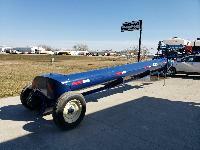 Drive, NEW Chains, 150 gallon liquid fertilizer tanks, Hypro hyd. pump, 2 bu. hoppers, Field Ready! CCS center fill 100 bushel double hopper, Hyd drive, Bauer narrowfold bar, Monoshox linkage, Precision AG completing package, Dickey-John Wind Boots, Narrow Gauge wheel Scrapers, 20/20 precision Drive.